If you have a wine loving relative, friend, acquaintance, customer, boss or employee and don’t know exactly what to get them as a present, why not send them one of our gift cards which range from £10 to £100? It can be used to purchase anything from our site in full or part payment of a product. And if the value of the Gift Card is more than the product, the balance is automatically carried over as payment towards the next purchase. There’s no expiry date. If you would like to send someone a gift of one of our products and don’t know which one to send you can send them a gift of one or more of our gift cards and they can apply them against any product that is for sale on our site. 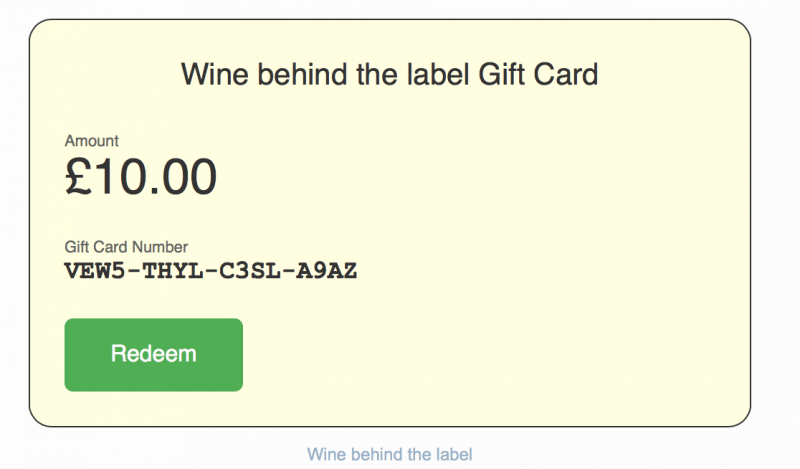 It’s quite easy – you just buy the card(s) to the value of the gift you want to send from the drop down menus on the home page, enter the email address of the person you want to send the gift to and they will receive an email with a unique number on the card. They then just need to press the button to redeem the card and they will be taken to our website to buy what they want. When they get to the cart for the first time, the gift card unique number will automatically be displayed and the amount deducted from the purchase price. If the value of the card is for more than the purchase, then the balance will be automatically deducted from the value of the next purchase. If you don’t make a purchase first time you redeem it you may have to copy and paste in the number to get the deduction – there are spaces on the checkout page to do this. So don’t lose the email because we don’t have any record of the numbers!